Grand Lake RV & Golf Resort is situated in a great location with easy access to many attractions. It’s conveniently three miles from Interstate 75. Citra is also 17 miles from either Gainesville or Ocala. The spacious resort has 409 sites that can accommodate the largest of RVs. What’s more, amenities include pull through sites, 30- and 50-amp electrical, two laundry facilities, and Wi-Fi service. RVers will also appreciate the heated pool, well-equipped fitness center, tennis courts, and the Eagle’s Nest Café. The Grand Lake Golf Course, which opened in 1990, is a nine-hole executive measuring 2,191 yards from the back tees. 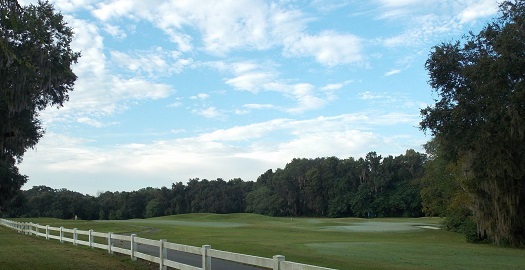 Well maintained, the Grand Lake Golf Course features six short par 4s and three par 3s. Golf carts are available, but this is truly a walking course. Except for an occasional three-wood, many golfers could only resort to the six-, seven-, or eight-irons, with a wedge and putter. Other features on the property include a driving range, putting green, a pro shop, and convenience store. In addition, a few things worth seeing in the local area include the Endangered Animal Rescue Sanctuary (EARS) and the Orange Shop. Every Wednesday and Saturday, informative slow moving guided walking tours are available on 35 acres where many animals call home. These include lions, tigers, bears, bobcats, monkeys, and more. The Orange Shop is a favorite of many visitors. Its been open since 1936 and features famous fresh-squeezed orange juice and options of shipping oranges home. In nearby Gainesville, the University of Florida Bat House is definitely worth a visit. The university campus grounds also makes for a great leisurely stroll. For the many RVers who love golf and the sun, Grand Lake RV & Golf Resort is a must visit, and a good base camp for nearby excursions. Is RV Life just for golfers?? Thanks for your question. RV Life is not just for golfers but for all those who the enjoy the RV lifestyle. Golf, for many RVers, is a very popular pastime that`s enjoyed on the road and at destinations. So, we a dedicated a weekly blog and a monthly column for those RVers looking to enhance their time when golfing and traveling.